Student writing has long been viewed as a problem in higher education in the UK. Moreover, the sector has consistently performed poorly in the National Student Survey with regard to assessment and feedback. Academics Engaging with Student Writing tackles these major issues from a new and unique angle, exploring the real-life experiences of academic teachers from different institutions as they set, support, read, respond to and assess assignments undertaken by undergraduate students. Incorporating evidence from post-1992 universities, Oxbridge, members of the Russell Group and others, this book examines working practices around student writing within the context of an increasingly market-oriented mass higher education system. Presenting a wealth of relevant examples from disciplines as diverse as History and Sports Science, Tuck makes extensive use of interviews, observations, texts and audio recordings in order to explore the perspectives of academic teachers who work with student writers and their texts. This book will be of interest to researchers, academics and postgraduate students in the fields of academic literacies, higher education, language and literacy, language in higher education, English for academic purposes and assessment. 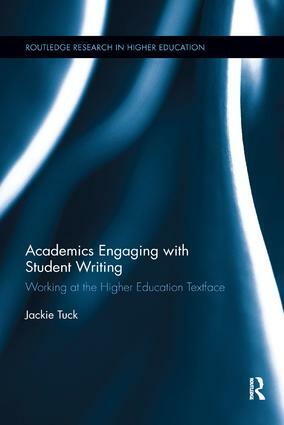 Furthermore, academic teachers with experience of this crucial aspect of academic labour will welcome Tuck’s pioneering work as an indispensable tool for making sense of their own engagement with student writers. ‘This book provides a ground-breaking "insider" perspective, ‘warts and all’, on what it feels like reading and providing feedback on student texts. It also tackles the thorny issue of how labour around student writing is distributed in contemporary higher education, and argues powerfully for the continuing importance of academic writing, amidst the plethora of other semiotic media, for learning and knowledge production in the 21st century.’ - Joan Turner, Emeritus Professor, Department of English and Comparative Literature, Goldsmiths, University of London. ‘Through the eyes of an academic in the disciplines, Jackie Tuck takes us into the vexed problem of student writing in the changing university. This ethnographic study shows brilliantly that the challenge of student writing is best understood as a crisis of meaning rather than skill. Set in the UK, but resonating beyond, it reveals how deficit views of student writing persist, and what’s to be done. This is the book we’ve been waiting for: a memorable and ultimately hopeful book on student writing from the inside, written with great delicacy and power.’ – Lucia Thesen, Professor in Research Literacies in the Centre for Higher Education Development (CHED), University of Cape Town, South Africa. Jackie Tuck is Lecturer in English Language and Applied Linguistics at the Open University. She has over thirty years of teaching experience in Applied Linguistics, English Language and Literature, Communication and Study Skills, English as an Additional Language and English for Academic Purposes. She completed her PhD in academic literacies in 2013.